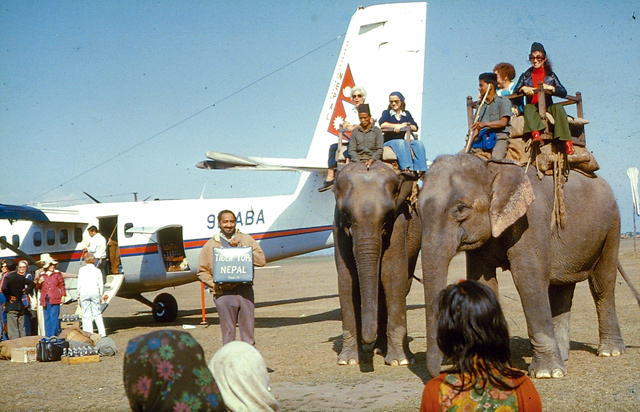 AIRPORT TRANSPORT: Elephants load up tourists at Meghauli airfield in 1972 before the ride to Tiger Tops. In khaki shorts and floppy hat I greet the arriving guests at the bottom of the wooden aircraft steps, the same ones used for boarding the elephants who are lined up patiently behind me, drivers lolling on their flat grey heads. On this particular afternoon, soon after I first started work at Tiger Tops, I am meeting a group of middle-aged middle-Americans who chatter excitedly as I supervise their loading for the two-hour elephant safari through the national park to the Lodge. The elephants heave themselves onto their feet to squeals of delight and clicking cameras. “Please do not drop litter and be silent once inside the jungle so as to maximise wildlife sightings – rhinoceros, deer, wild boar, monkeys, crocodiles, birds and always the chance of leopard or tiger.” A frisson of expectancy crackles through the group. To the north, the shadowy white outlines of the Himalaya float above the wrinkled middle hills. Most days I take the open baggage vehicle back to the Lodge but today it is piled high with provisions so I elect to join the Americans on the elephant safari. My ride, Rup Kali extends her hind leg on command from Sultana, her wiry dark-skinned driver, so I can climb up onto her back. He turns and nods as I clamber up the ropes, holding onto the howdah bar and balancing on her bony grey back in my thin plimsolls, feeling smugly like an expert. Off we all lumber, across the river and into the trees. Having trawled the thick grasslands and passed a couple of pools left stranded by the ever-changing Tarai waterways, the wildlife safari is running its course and the afternoon light is fading to rose. Weary from hanging onto the swaying howdah and dodging branches, I decide it is time to get back to the Lodge. The elephants emerge onto a Park track that I recognise, and I signal to Sultana that I’ll get down and walk. Setting off on foot down the long straight jungle road, I ignore a sound in the bushes, my mind occupied with dinner recipes dependent on today’s supplies and my legs enjoying the exercise. The crushed-insect scent of pale clerodendrum flowers is heavy in my nostrils and a fine dust rises with my footsteps. A shout alerts me. I turn in horror to see a large rhino emerging onto the open road behind me, a young calf close to her side. Mercifully, Rup Kali and several other elephants are still on the track, not yet having faded into the forest. The mahouts urge them backwards, anxious not to drive the rhino closer towards me. Stories of adrenalin-fuelled feats in the face of extreme danger flash through my frozen brain, but there is no way that I can find a climbable tree to scale from among the smooth trunks of the towering sal or solid silk-cotton trees whose horizontal branches are of unreachable height. The rhino mother, short sighted and aggressive in protection of her young, pauses uncertainly on the track. Head high with concern, she turns first to me and then to the retreating elephants, assessing her options. Deciding I am the easier target she charges towards me, the baby close behind. Another revelation — how quick and nimble is an oncoming rhino, despite its massive bulk, and how impressive her huge size and great folds of rough skin, like armour plating. I have no hope of outrunning her, and can only clamber onto the high but inadequate buttress roots behind a handy bombax tree. Rup Kali with her load of startled tourists and Sultana in full cry hurtle down the road in pursuit, trumpeting, shouting, waving and throwing sticks. The rhino veers away and takes off into the undergrowth. That evening much Khukri rum flowed in the elephant camp at my expense. 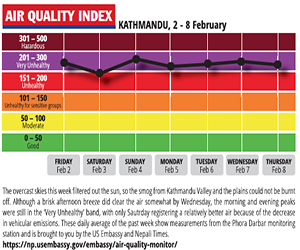 I was mercilessly teased for my ignorance of the danger of walking alone in the Chitwan jungles. I can still taste the fear and feel my trembling knees as I cowered uselessly behind that tree. Too little knowledge and too much confidence is a treacherous combination in the wild. But I had survived the lesson, saved by Sultana and Rup Kali.